I can't really count the first day of this trip as we didn't see any trains- well except for the journey to Luton Airport. Luton was as chaotic as usual with the shuttle bus taking around 20 minutes, far more than the 7 minute journey it proudly announced due to getting stuck in traffic most of the way to the airport. Wizz did the honors of flying us to Kocise which was uneventful. We picked up our car and made our way to the Hotel Kras in Rosnava which would be our base for the next four nights. The hotel was fine except for the lack of any sort of air conditioning or a fan in the rooms resulting a few uncomfortable nights. Despite the hotel lady telling us that there were plenty of eating options we couldn't find any in the main square which served anything other than pizza. After a reasonable, and cheap, meal we almost went 'out out' via a few bars but our success rate sealed the fate of the evening- the first bar appeared to be entirely occupied by a wedding party, and the second- which looked very good- was totally empty! While the main aim of the trip was to search for 'grumpy' diesels we headed north to the mainline in the hope that this would be a bit busier on a Sunday. Weather was good and we found several pleasing locations between Straba and Liptovsky Michel. The line was reasonably busy with passenger services mostly in the hands of 362's and 363's with the odd 350 and pendolino thrown in. 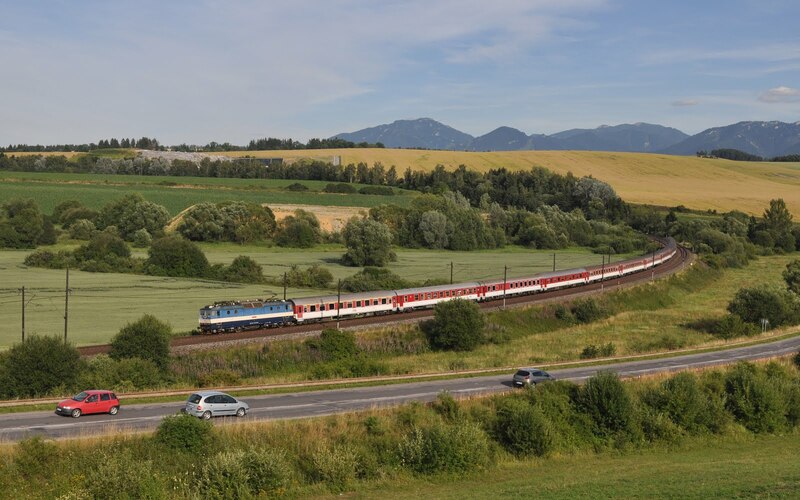 RegilJet also operate some trains over the line which are hauled by their new Vectron locos. 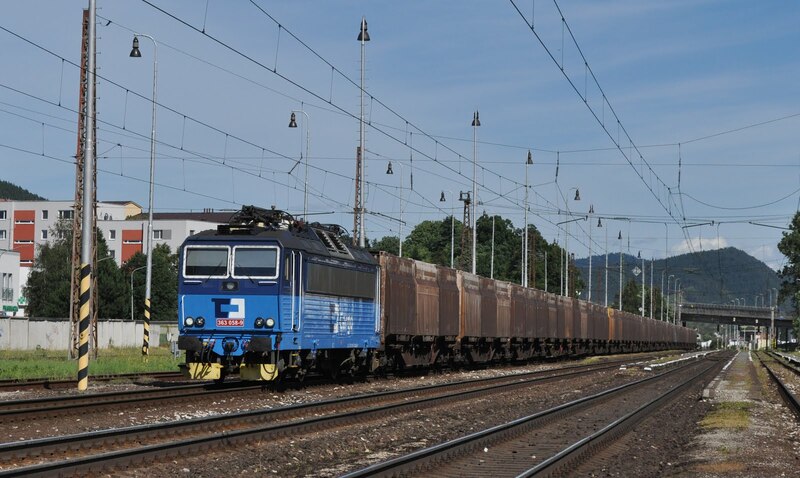 Freight was almost exclusively in the hands of the large double-section 131 locos. There were a handful of trains hauled by the older electric 183's but none of these ever seemed to be going the right way for our shots. The successful day was finished off with a very nice meal from some sort of traditional log cabin style restaurant on the road back towards Poprad before we again crossed the mountains for a fairly late arrival back in Rosnava. In almost pristine condition silenced 751 171 prepares its train to leave Dobsina for Plesivec. Grumpy reflections. The final timbers are loaded at Dobsina. Today was the beginning of the 'Grumpy' search properly. James who I was travelling with and who had worked out pretty much the entire plan for this trip (Thank you!) had acquired the freight timetable for the line between Zvolen and Kocice, and while it wasn't going to be a procession of trains we were confident we had the gen we needed to secure a good number of photos and to be in the right place at the right time. We first headed to the crossing at Roznava for an eastbound freight and got our first disappointment of the trip- due to a timetable reading error we were a few minutes too late and didn't see it. Not that I'm convinced it ran anyway. Still... all was not lost that was only the first train. 751 125 prepares to head west from Plesivec with a short freight. The Grumpy diesels in this area are based out of Plesivec and daily trains are booked up three branch lines. We chose to to head up to Dobsina on the branch that was closest to us having already seen some good photo spots here the previous day. 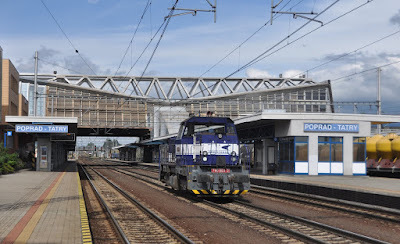 There is no passenger service so the Grumpy freight was our only chance- fortunately we got to Dobsina and the train was there, and so was our first Grumpy diesel- a rather pristine 751 171. The only downside was that it was silenced. It soon became clear that it was not going to depart at the time we had down of 09:10, but the helpful staff in the yard were able to tell us that it would instead depart at 10:30. 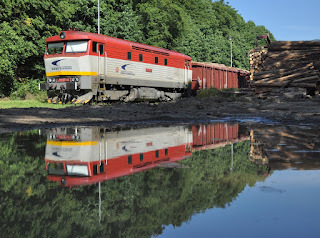 We waited around in the yard and got some good photos before the four wagon timber train departed with minimum noise. 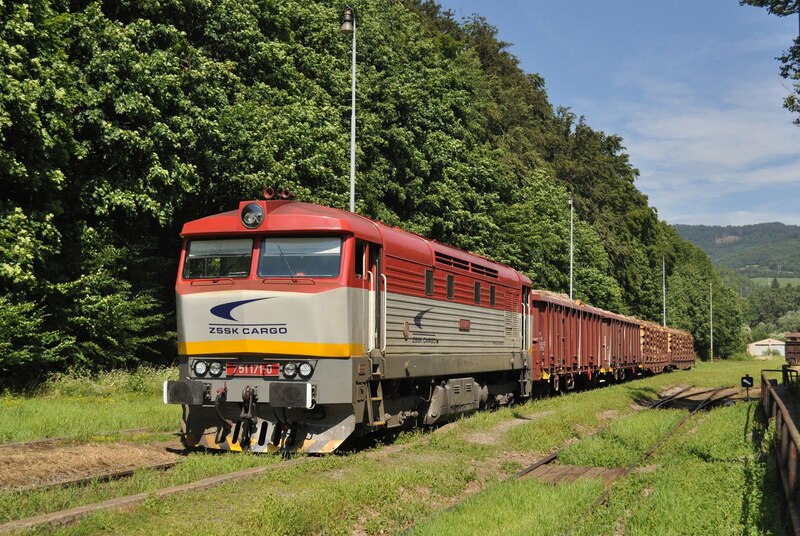 We were able to catch up with it twice along the branch- the linespeed being low and also with the train stopping to pick up further wagons at Betliar. 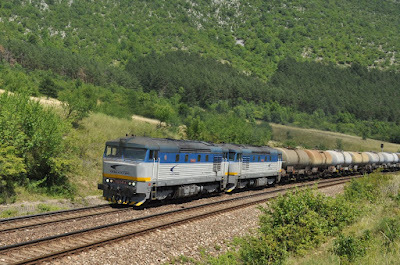 With this success in the bag we then drove to a location on the branch to Muran which should also have a daily freight with a pair of Grumpies- less success here though as the train failed to produce when we were expecting it. Given our experience on the Dobsina branch we waited around for a bit, but were rapidly coming round to the idea that the freight timetables needed to be treated very much as a guide. behind is stored despite appearing to be in good condition externally. Back to Plesivec to see what was going on and if there were any trains around. There was at least some activity with 736 001 shunting the yard and plenty of Grumpy diesels stabled on the depot- both active and stored. 751 125 departed with a westbound freight while I was photographing the depot- the shunter having said it was ok, but just as I was photographing the last locos a fairly polite office worker telling me that it really wasn't. We waited for the lunchtime 'Goggles' to pass the station with 757 018 and 757 008 (the eastbound being about an hour late). 746 013 was also formed up with another westbound train and we decided to hit the road in search of somewhere a bit more scenic for the afternoon trains. A bit of a sat-nav failure and not entirely remembering the location we had planned to end up at we found ourselves near Ciz Kupele for the next train in a less than ideal location when 751 123 and 751 076 passed with a westbound freight. 761 006 climbs uphill at Ciz Kupele in the afternoon light. We had moved to Ciz Kupele station for the next passenger with 757 018 and found a pleasing bank to wait for the afternoon Grumpy action. Sadly the only trains we saw for the rest of the day were 746 013 followed shortly by Metrans 'Hercules' 761 006. The day had not been nearly as productive as we had hoped, but we had a few good shots... and at least ALL of the trains we had seen had been going the right way- it could have been far worse had we been waiting for westbounds! Determined to see more trains today we opted for the tactic of finding a spot and staying in it. That spot was at Hrhov- now all we had to do was wait... and wait... and wait. The morning westbound failed to produce and the first trains we saw were the morning passengers some two hours later. At least the weather was good. Possibly too good- I had to shade under my umbrella to escape some of the heat! By 12:30, 4 hours into our stint we had not seen a freight (unless you count a light loco or track machine?). Then things kicked off... a rumble around the corner heralded the arrival of 752 041 and 752 047 with a tank train. It also prompted one of the very few clouds in the sky to come along and somewhat ruin the shot! Not amused! 752 041 and 752 047 with our first freight of the day at Hrhov. Fortunately 10 minutes behind one of the daily stone trains appeared with 751 057 and 751 073- our quiet friend 751 171 was on the rear banking. It was by now lunch time, we had resolved to leave at 13:00 come what may, and having just seen our only two trains in 4 hours we were fairly happy we weren't about to miss another. Wrong. Half way down the hill and another rumble. 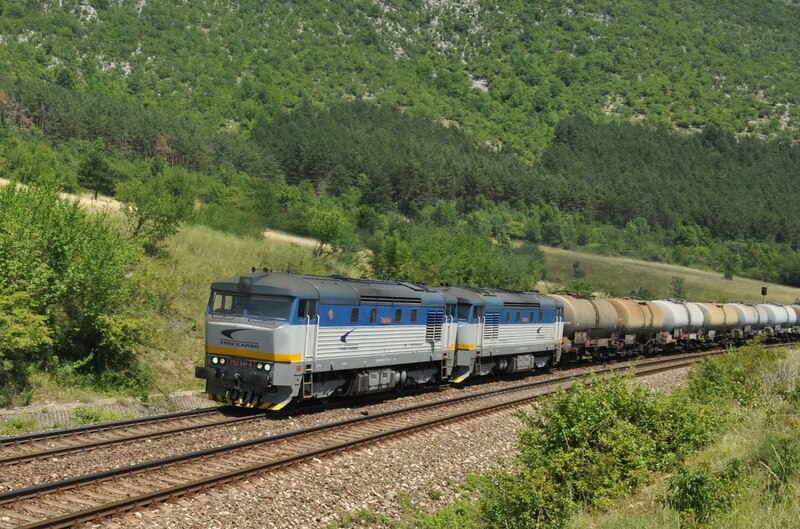 Fortunately I was able to sprint up the hill, despite the heat to catch 751 199 and 752 045 with a short mixed freight. To my amazement the signal had also gone clear in the other direction and moments later 751 076 and 751 123 passed downhill with a mixed westbound freight. Now it really was lunch time, from the local petrol station (which did actually have reasonable sandwiches). Back to Hrhov for the afternoon and the total number of freights seen was precisely zero. We tried one more location on the way back to base, again seeing nothing. The final bet was to pop in to Plesivec to see if there was any activity there- nope. Pizza time then. 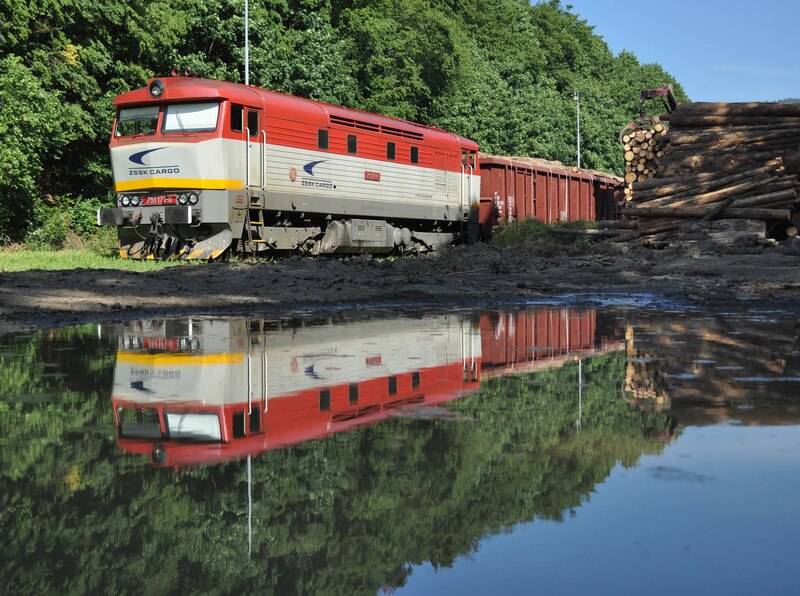 4 freights in almost 12 hours wasn't quite what we had been hoping for but at least they had all been Grumpy hauled. 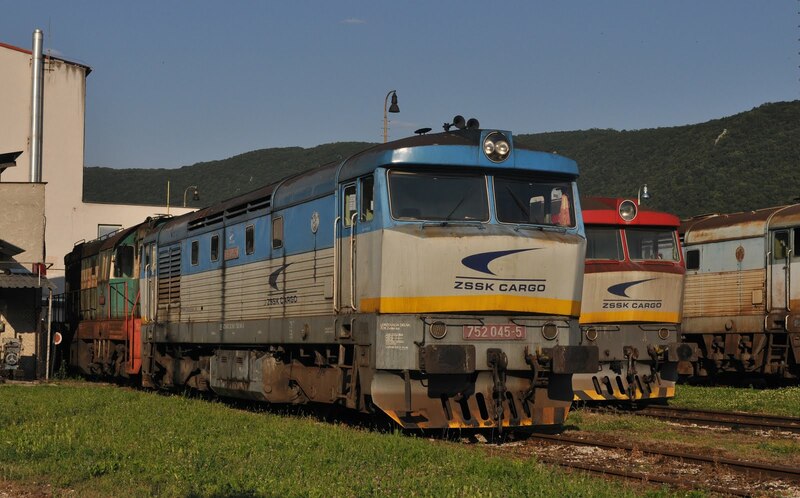 754 is stabled at Filakovo with a train which will work towards Zvolen. It was up even earlier to have another go at the morning shot at Hrhov. 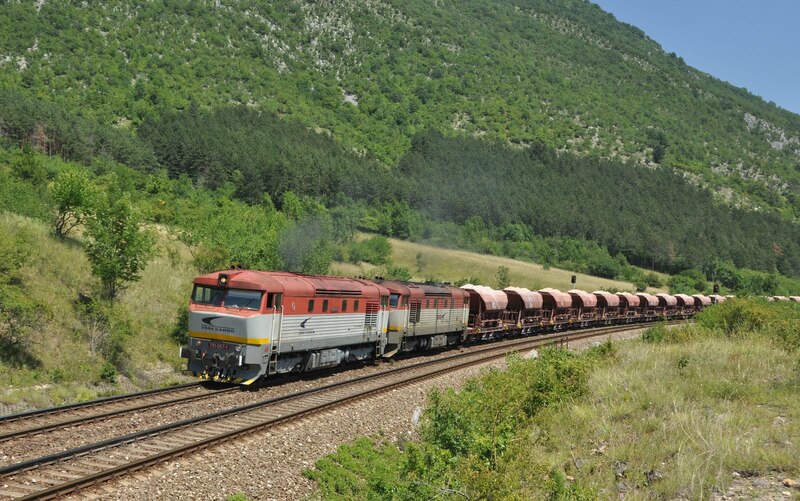 We were confident that the stone empties would run having seen the loaded train run the previous day. They did run... but around 30 minutes early as we were parking the car... cheers then! It was cloudy anyway. 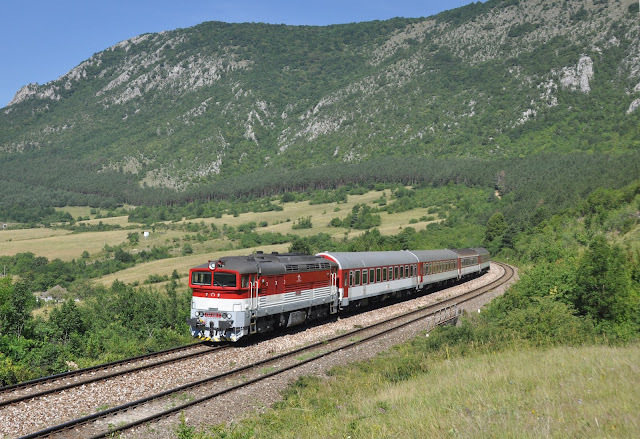 We waited until the booked time of the mixed train that hadn't showed up for the last two days- we weren't surprised when it didn't again! Back at Dobsina 751 126 waits with the log train for Plesivec. Ah well... back for another go at the pretty Dobsina branch. Train present and correct and looking almost ready to go... but no loco! Oh dear this wasn't looking good. The staff didn't seem to know why the loco wasn't there but advised it would turn up. Sure enough 751 126 did appear, and it wasn't a silenced one this time. We had this nice idea that with the train ready to go it would be a quick case of coupling up and heading off- but it was not to be. A very complicated shunting operation was required to get the new empty wagons into position and then shunt all of the loaded ones around. This would have been fun to watch were it not for the fact that every wagon seemed to need some adjustment to the timber load- this took forever and we needed to be back on the main line for the lunchtime 'rush'. Eventually the train got to the point where the loco could shunt from the front end and some sunny shots were finally acquired. 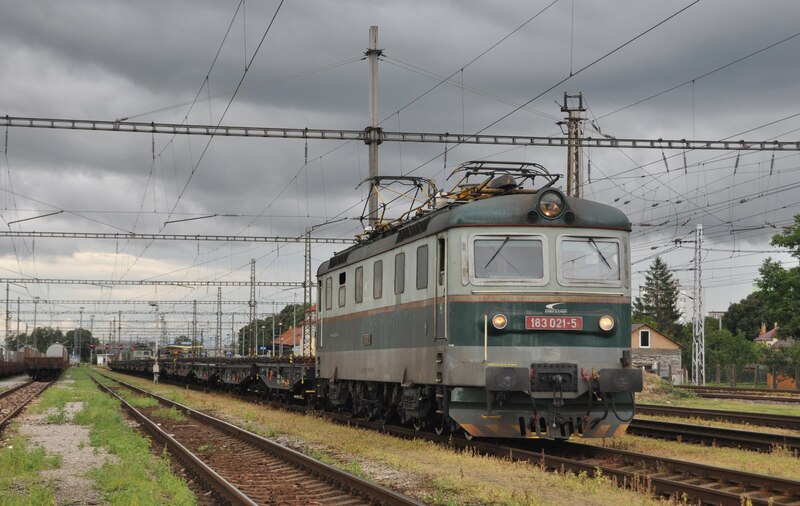 We didn't have time to watch it leave as we wanted to be in position at Jovice for the lunchtime trains. We needn't have rushed as they were late (and it had clouded over). 736 012 and 736 023 disappointed on the tank train and were followed by 751 123 and 751 076 on the stone train, 751 077 was the banker, but not doing much as it was downhill at this point. So at least this train seemed to be reliable. It was chased slightly until James dropped me off at Roznava station to have a spin on the Goggles. 757 008 was my loco heading west towards Zvolen- fortunately with a couple of 'fresh air' coaches in the consist, some sets we had seen had been all air-cons. 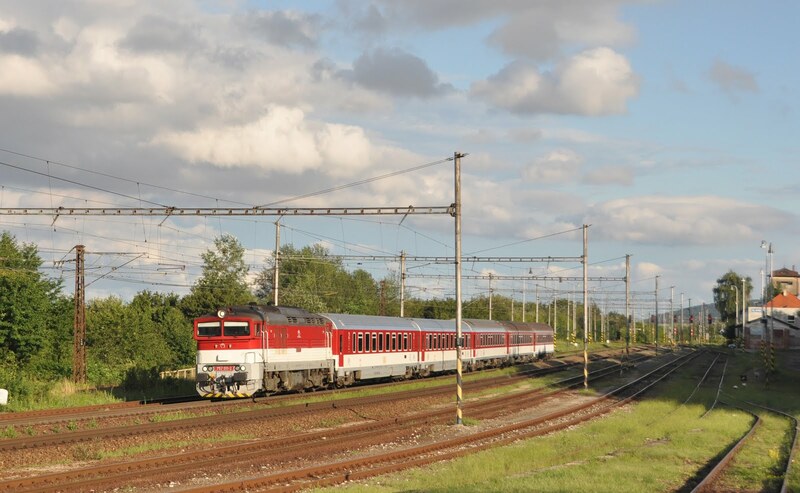 I had an enjoyable, if quiet ride to Filakovo where I would intercept the train back to Kosice and meet up again with James. Filakovo proved to be a good place to stop as loco hauled local trains from Zvolen turn around here meaning that there were a couple of the slightly more attractive 754's to watch while I waited. The station was also home to a plethora of 812 railbuses and trailers. Slightly concerning was that my return train to Kocice had not turned up by it's booked departure time. Eventually it did, around 20 minutes late and I had to do a double take... 757 008! 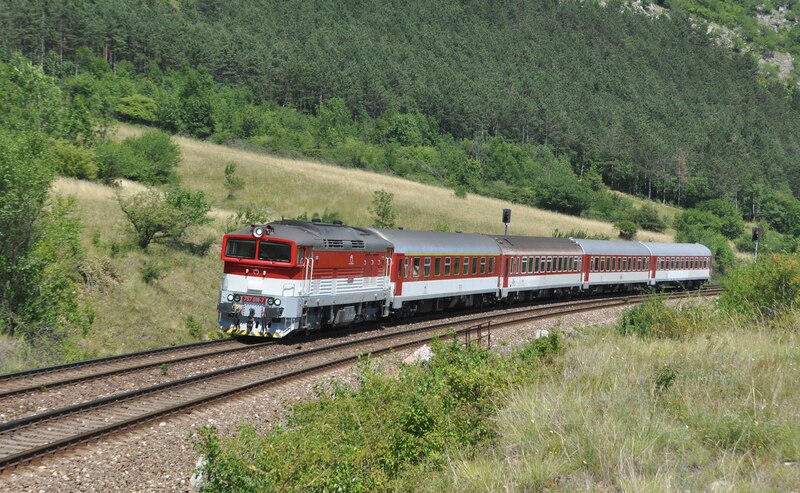 But that was the train I had just got off which still had an hour or so to reach Zvolen?! 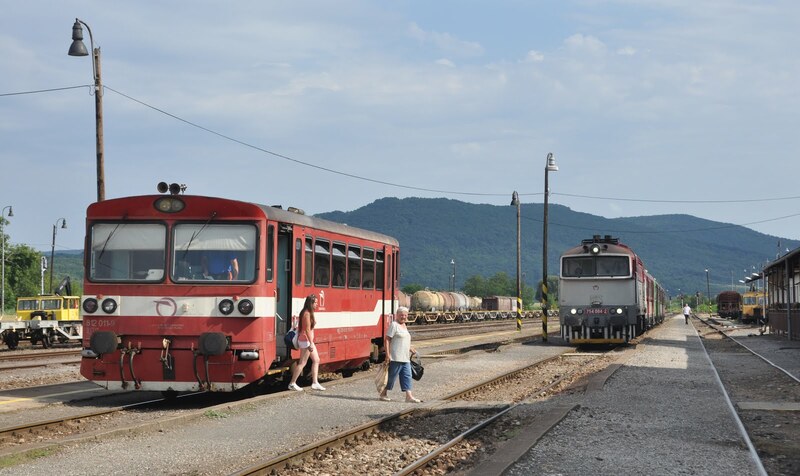 Clearly the train had only gone to the next stop at Lucenec and turned around. That would explain why we had only seen two 'Goggles' all wee, and also why the eastbound trains had mostly been late. Would it also explain why the volumes of freight had been so low? 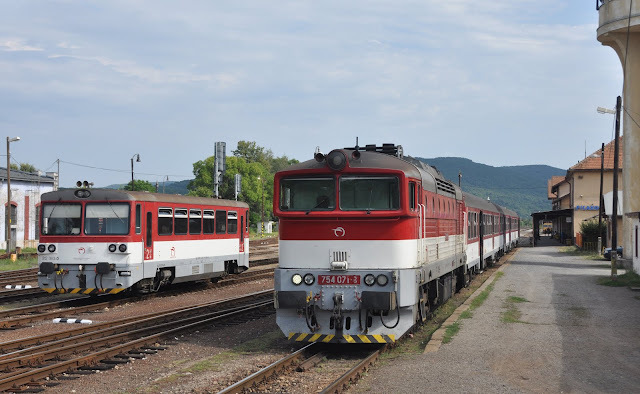 Was the line blocked between Lucenec and Zvolen? But then what were the local 754's doing? If anyone does know I'd be really interested to know what was going on please! 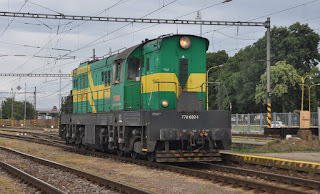 757 008 was taken through to Kocice. The arrival through the tower blocks and industrial areas not giving a great first impression of the city. After photographing a couple of trains at the main station it was time to dodge an approaching storm and check into our hotel here the rather odd 'Pension Grand'. This building had clearly been something else fairly recently, with a large central covered courtyard and a reception desk converted from a bar. Quite what it had been we never did work out- but again the room was hot! It turns out that the old town of Kocice is much nicer than the suburbs had indicated and we had a nice traditional meal in one of the side street restaurant. Our last full day in Solvakia and time to head further east. The weather had not dawned clear like we had been used to and we drove through torrential rain to reach our first spot at Ruskov. The staple here were passenger trains in the hands of the Skoda 163/363 electrics and also Goggles while freight was handled by 131 double locos banked by a 183 which detached in the station and ran back light engine. We did have a few clear spells and got some reasonable pictures before moving on to Trebisov. We had been tipped off that there was some Grumpy hauled trip work here, and no sooner had we arrived than 752 023 appeared light engine. Unfortunately it was to shut down and park up for the day, but it was still nice to see it. 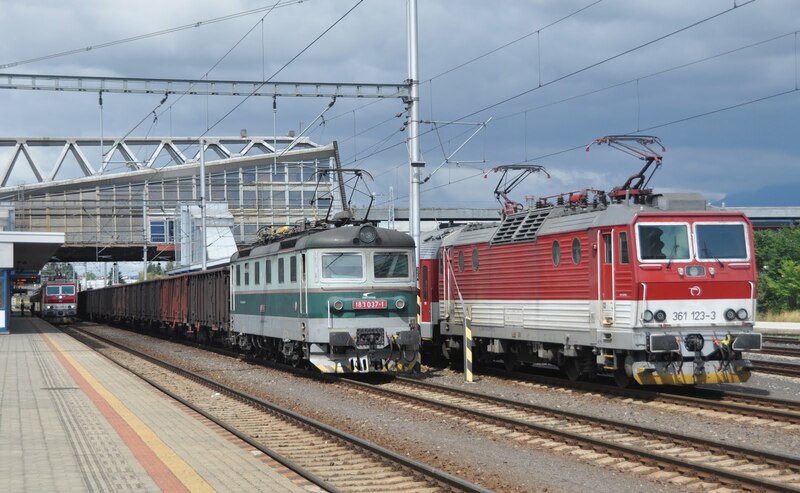 Passenger traffic was a bit more varied here, with most of the trains from Ruskov supplemented by some 812 railcars and old 460 EMU's. Freight traffic was very sparse but a little more varied with a couple of 183's. Also parked up in the station were 770 602 and 742 540- the former departed light engine and made a good racket in the process! 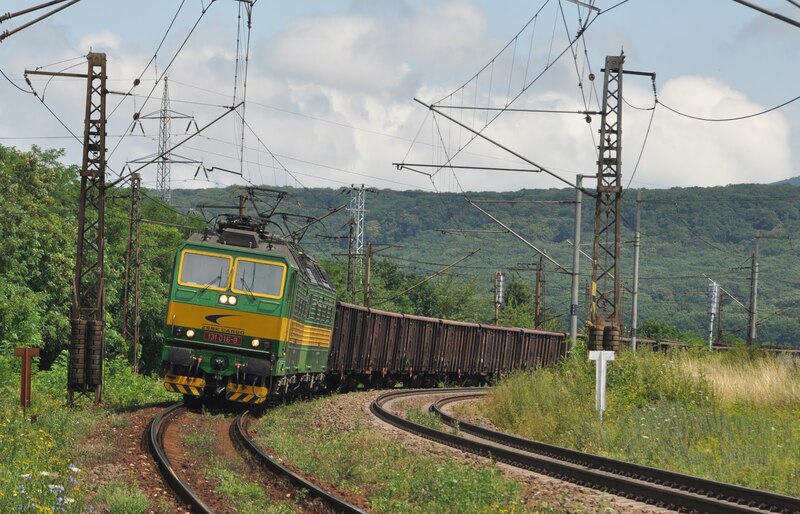 What had been missing from both of these locations was any sign of activity on the broad gauge line which runs from the Ukranian border to Kocice and passes along side the standard gauge system for much of its length. We had had it in sight for around 8 hours but there had been no sign of a train. Our final chance was our last stop at Slanec. 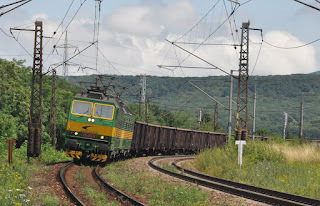 Not long after we arrived a broad gauge freight finally appeared with a pair of double electrics- 121 814 and 121 824. It was great to see- but the light was appalling! Fortunately it was made up for by a cracking final shot of a Goggle passing on a passenger. This photographed it was back to the airport to drop off the hire car and then a quick cheap and simple transfer back to the city on the airport bus. We think the 60cent tickets were the right ones! 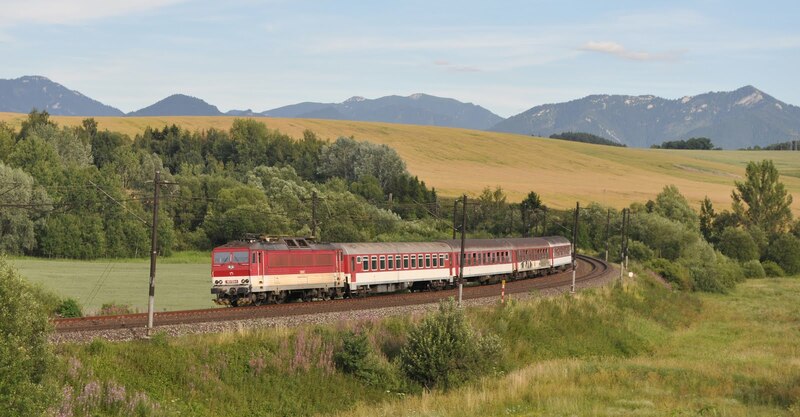 All we had to do to day was get home, but via the airport at Poprad-Tatry (it had better flight times than Kocice and I had a non-negotiable date with 50027 on the Mid Hants Real Ale Train!). 350 013 took us to Poprad-Tatry in great comfort where we then had just over an hour to see what turned up. 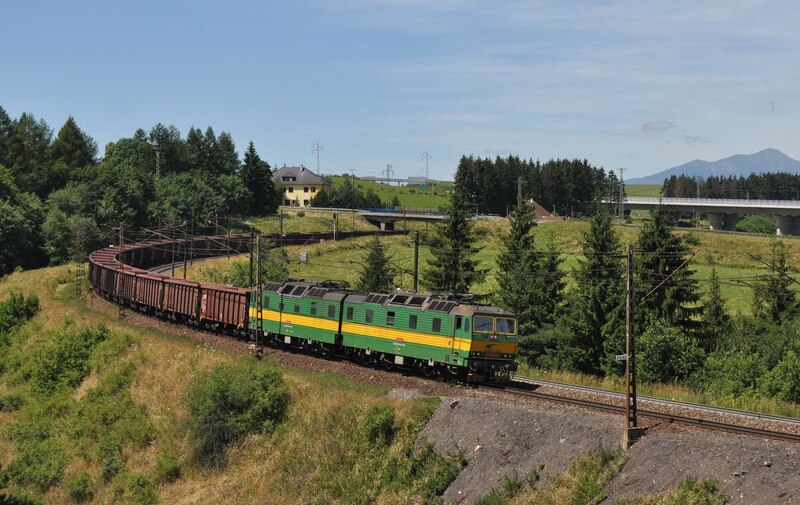 A couple of freights were seen in the hands of 131's and 183's and a few snaps were also taken of the passenger trains including the rather uninspiring EMU's which now work the Tatra Electric railway which starts from here. The Wizz flight home was slightly late but Poprad-Tatry airport was modern and well equipped. Luton was actually fine... none of the expected queuing at the passport control and the e-gates even worked! The bus was a farce though taking again over 20 minutes due to roadworks. Just to annoy everyone even more the bus took a diversionary route right past the rear entrance to the station- but didn't stop there- we just sat in traffic for another 10 minutes watching the trains pass! Not withstanding this I made my planned train and the 50 was most enjoyable as well!!! We really like the 'Grumpy' diesels and it is such a shame they no longer work any booked passenger turns. Clearly the 751 fleet is still being maintained and well looked after in the Plesivec area and doesn't seem to be under any immediate threat. The line is quite scenic with many photo spots- I'm not sure though whether the low volume of traffic warrants a return trip to the diesel lines. Slovakia however is definitely a country I will be returning to. Thanks to James Hawkes for the company and planning of this trip. Thank you Andrew. I'll try to work through your corrections when I get a chance.